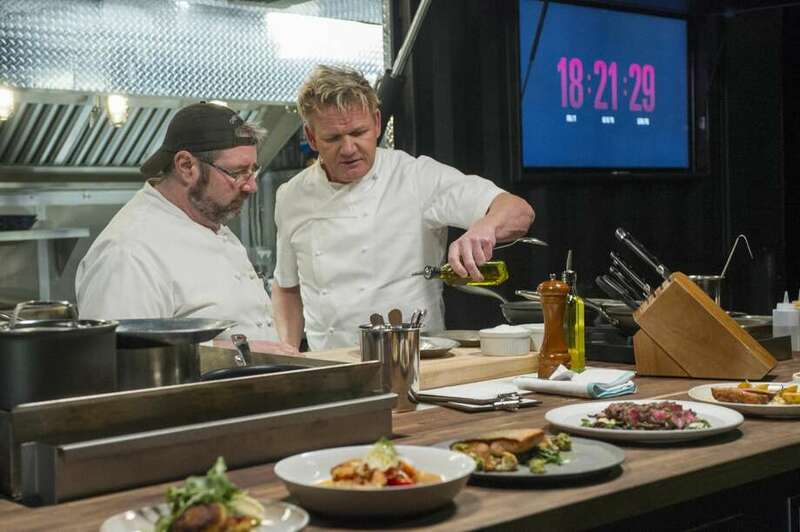 Chef Peter Hamme, left, of Stone's Throw in Seymour, and host Gordon Ramsay, right, filming an episode of 24 Hours to Hell and Back airing Wednesday, Jan. 30 (8:00-9:00 PM ET/PT) on FOX. Stone’s Throw Restaurant, in Seymour, will be featured on an episode of “Gordon Ramsay’s 24 Hours to Hell and Back,” on Fox Wednesday, Jan. 30, at 8 p.m.
During the 24 hours the formal dining rooms and entranceway were redecorated with a “lakeside-lodge feel,” the restaurant said. The menus were paired down to include some of Ramsay’s specialties as well as some original Stone’s Throw recipes. Ramsey’s hidden cameras revealed how management had let standards slide. The cameras also revealed that several Stone’s Throw employees are cancer survivors. Seymour Pink, a local organization that unites the community in the fight against breast cancer, was a major player in the relaunch of the restaurant, the venue said. Stone’s Throw incorporated the changes suggested by Ramsay and continues with their regular events including its Sunday Live Jazz Brunch on Sundays and quarterly Wine Dinners.